We believe children flourish when they have a place to be creative. 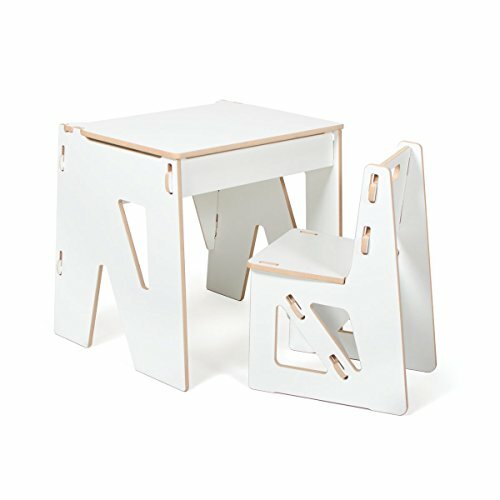 This wooden kids desk and chair is a great foundation to start that little studio. The sprout childrens desk has a lift lid top with plenty of storage space to organize all the little necessities and treasures of childhood. The ideal kids study table for small or limited spaces, it can assemble and disassemble quickly and easily, and stores flat when not needed. The kid friendly design features a pinch free hinge, washable melamine surfaces, rounded corners and edges, a wide base for stability, and CARB-2 compliant MDF construction. With color options in white, grey, aqua, and green, you are sure to find a desk that is perfect for your child, and fits nicely in the modern design of your home, working just as well in the kids bedroom, the corner of your office, and even the living room. Our sturdy modern desk will see your children through their formative years, and by then, we'll probably have something a bit more your size. Like all Sprout products, the desk is designed and made in the USA so we can ensure you the highest quality product. Is perfectly compatible with Sprout's chairs and stools.